Re: Re: Bakelite Corp. -- Beadman Post Reply Edit Forum Where am I? I'd love to see your reference material. Here's a cut from a Newsletter I just received this morning. The source of the information is a 94-year old woman, Mrs. Nancy Byck Welch, who is the daughter of one of Baekeland's first employees. She was interviewed by Reindert Groot, who runs the Amsterdam Bakelite Collection. The clip indicates that Bakelite jewelry was made by the Embed Art Co. up to 1926, and that European competition put them out of business. Which conforms my view that beads were being made from cast phenolic resins before 1926, in both Europe and the US. 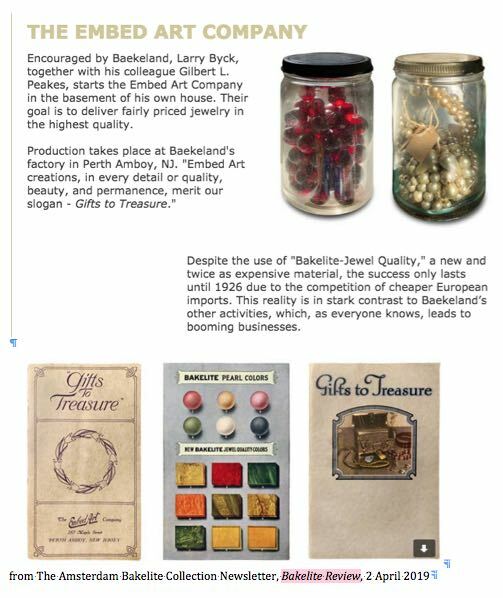 I am currently trying to get in contact with Reindert and find out more about the history of Embed Art Co., especially when they began production of beads. Or possibly visit Mrs. Welch myself since she lives in the US. My intention is to add information that may be of use to the bead world. My main disagreement is with your contention that there were no cast resin beads before 1926. I think this is misleading to bead collectors as I have evidence to the contrary. I also have firm evidence that the Bakelite Corp. made both cast and molded products so your contention that there are NO cast resins from Bakelite Co. is in error. I don't think your advice is practical, since it isn't accurate. There is new information unearthed about beads of all types, all the time, and we should be willing to incorporate it into our research.